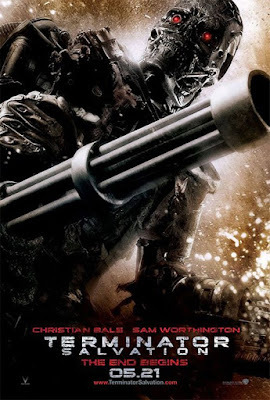 Terminator Salvation stars Christian Bale as John Connor, Sam Worthington as Marcus Wright (man reborn as robot-man), Moon Bloodgood as Blair Williams (who has a crush on the robot-man), Helena Bonham Carter as Dr. Serena Kogan (the voice of Skynet), Anton Yelchin as Kyle Reese (John Connor’s past/future father) and Bryce Dallas Howard as Kate Connor. Right away we meet Marcus Wright, a murderer on death row. About an hour before his lethal injection he decides to donate his body for scientific research. “Cut it to pieces,” are a few of his last words. About 20 years later he wakes up, only now he is partially organic, the rest robotic. He doesn’t understand what, where or when he is; he just knows that he is alive. Marcus goes on to save a couple of children as well as a young lady named Blair. That night he asks Blair “Do you think people deserve a second chance?” She answers, “Yes.” He isn’t talking about humanity fighting against extinction at the hands of robots, though she might have thought that. He means “Do I, the murderer who was supposed die by lethal injection, deserve a second chance.” Indeed, he was living that second chance as he uttered the question. Marcus’s story is all about redemption. Redemption is bringing life out of death, injecting value into that which was worthless or producing good out of that which seemed to be pure evil. The last part of his life demonstrates the fruits of redemption, which is more redemption for others. Toward the end of the movie, he offers his own rebuilt heart to John Connor so that he can continue leading the Resistance against Skynet. In this way Marcus gives away all of his human self to help humanity strive toward a better existence. At the same time, the fact that Skynet, the enemy, re-constructed him to be mostly machine makes it possible for him to live again. Though his rebirth was designed to destroy life, he uses his mechanical elements to infiltrate Skynet and ultimately help all people strive toward freedom. In a similar way, Jesus Christ brought redemption to all humanity through a regular, human body. Right when humanity seemed fit only to destroy self and others, God came in the form of a human to inject life and a new nature into all people. Notice that twice in Terminator Salvation Marcus is bound and then raised upright in a similar position as Christ on the cross. Marcus would eventually sacrifice himself to save countless other lives. As the title of the movie implies, the humanity of that time is in dire need of salvation. John (the Baptist?) Connor saw something different in this man, Marcus, who was fully human as well as potentially immortal, if he kept living as a machine. Also, once or twice John is called a “prophet” who is destined to lead people to freedom from the machines. i missed your reviews. long time, no read hehe. Glad to see your back writing! I was praying for you as I was unsure where you have been. Glad to see you are still here. I like the way you made those connections. Great review. Great review. I fully agree. I'm very glad you're back.